I've got a longer post brewing for next week, but I thought a short post about a pet peeve. 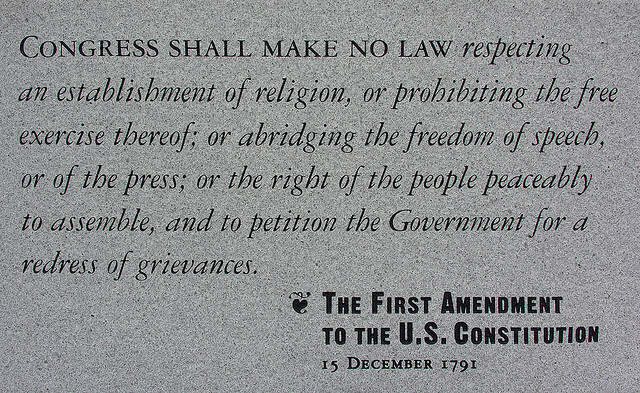 The first amendment protects against the government silencing you or erasing your words, and only the government. If someone else deletes your words, like GoodReads or The New York Times or even a blogger (yes, I have deleted comments from this blog - not often, but I have), it is not a violation of your first amendment rights. Here's my question: how is it that so many people misunderstand this? I genuinely don't understand this, so I'd love hear your opinions. Post Script: It feels weird to look at that title considering what Congress is doing - or not doing, which is more to the point - today. I think it's because people think the Right to Free Speech is universal and as such they think they should be able to say whatever they want, whenever they want, without suffering any consequences. A position which is ridiculous in more ways than one. Apart from your point about the First Amendment stating its only government that can't silence you, law can and will. Hate speech is punishable by law, at least it is here in the Netherlands, and I suspect in the US as well. People seem to forget that there is a difference between public and private spaces and that actually any space that isn't run by a governmental agency (such as the library) is considered a private space. I also wonder how much of the blurring between private and public spatial awareness (is that a term? If not I just coined it ;-)) is due to the erosion of the concept of privacy due to the internet and social media. 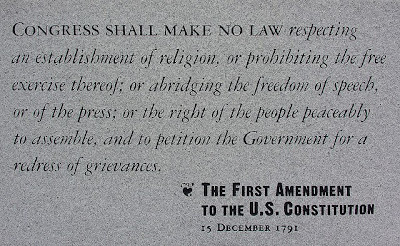 The First Amendment is only enforceable in the US and not all countries have the same rules regarding free speech, some are freer and others (for more than the reverse) are far stricter. That might also play a part! In short, I think people often do know, but use it as an easy excuse. On the other hand, Goodreads arguments for review, comment and shelf deletion and their implementation of their new rules is rather debatable. But ti is completely legal and in no way infringes on the First Amendment. I also think it's a confusion of what is public and what is private space. People seem to think that "public" means wherever there are other people. I noticed this recently in a series of comments about Starbucks requesting that customers not come into their stores with guns, and folks thought that was an infringement of their 2nd amendment rights, and that Starbucks is a "public" space.